If at all possible, I like to wear flip flops. But this winter, with all these nasty polar vortexes, that hasn't been an option. If I can't wear flip flops, my next choice are my Merrells. They are lined with fleece and slip right on, so toasty. They have held up forever. This year I bought a second pair in black with some of my Christmas money. Paul also loves Merrells, and bought himself this pair in brown. 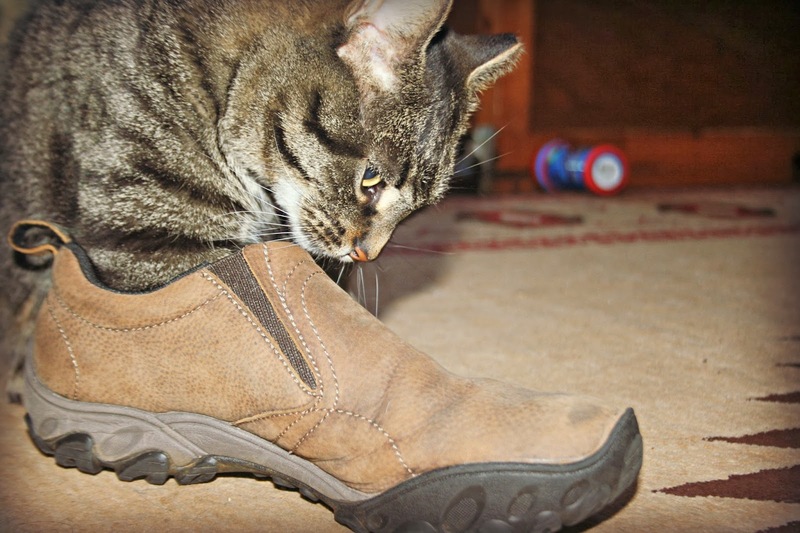 Even our cat, Willie, seems to love Merrells. Who knew he was such a shoe enthusiast? But he hugged this shoe for a good ten minutes. He has good taste in footwear, don't you think? Readers, do you have a favorite winter shoe? als hij ze zelf heeft goedgekeurd dan is het wel een hele goede koop geweest. What a cute photo. When I first get a new pair of shoes, my cats look startled the first time they see them! They are really observant. Lowa is my favorite boot brand. It just FITS! I am learning to like my Keens though, and will likely use them more in warmer weather than the Lowas as they have less insulation/padding. If I could get another pair of Lowa Exit Low's, I would wear them all summer long! I love my Merrells too! I have a little trick. I usually wear a womens 7 1/2 which translates to a kid 5 or 5 1/2. The shoes are the same quality but about 1/2 the price. Next time you need a new pair, try kids. I had a pair I wore for years. I have a light weight hiker of theirs now that give me more support. I love my Lands End and LL Bean shoes that look very similar to your Merrells. They're very comfortable and I love being able to just slip them on. Our Thunder Cat loved my shoes. He would wrap his legs around them and stick his nose inside. He was so funny about it. I love my knee high boots for cold days. I have a pair of Merrells for hiking and they are awesome. barefoot in my simple sandals. Those look quite cool and I'm with Willie I'd nab them too. (Willie resembles Roland, and our old cat TuiTui, same markings: an American, French and Saudi Arabian funny how they all look so alike. Comfy shoes are like a good friend! These look super comfy! My favorites are my Clarks. I was lucky and found one pair at a thrift shop for just a couple bucks...and they lasted me for years before the soles finally fell apart and I sadly threw them away. Tex's comment made me chortle! I used to love my Birkenstock boots but, alas, they gave up the ghost after many years of use. They look exactly like my husband's Merrells that he bought a few months ago. He wanted a style he could slip into to go outside and then off again just inside the door. His are black. He's been very happy with them. I buy whatever is cost effective at Walmart. Sometimes I order boots from Major Surplus or Sportsmans Guide. My son, on the other hand,goes to shoe stores in Cincinnati and buy a pair of boots for $150.00. Yep. You both have good taste in footwear. CUTE! In the winter, I wear boots any time I have to leave the house. The rest of the time, it's my Betsey Johnson lace house shoes! Mommy would love a pair of those,, since they slip on easily. She is usually lazy and wear cold wet garden clog things. What is it cats and shoes? Was he rubbing his face on them? Mine does that--I don't know if it is the leather or what. Weirdos. Seriously good brand. You and I are similar in our shoe taste, and, I imagine, similarly hard on our footwear so quality is EVERYTHING. I have been wearing tennis shoes - but I have had Merrells and I love them too. They do last forever and are really comfortable! Looks like a great choice for winter! I'm always at a quandary when it gets (slightly) cold here because I too wear open toed sandals. This year, I found a great pair of Hush Puppies tall boots; they are so comfy! The merrills DO look comfy! I've been wearing my Birks out to bring in wood. It builds character!!!!! The shoes look great on him. They are the perfect color! ;) When it's cold and slushy, I always choose warm and cozy.